Dr. Martin Luther King, Jr. would have been 89 years old this year if he had not been gunned down in Memphis, Tennessee nearly a half century ago. Today amid the openly racist character of the United States Government under President Donald Trump may have been partly responsible for the enhanced participation in activities commemorating the federally-recognized holiday of the martyred Civil Rights, social justice and antiwar leader who was only 39 when he was assassinated on April 4, 1968. Detroit has been a center of the African American liberation struggle since the times of the Underground Railroad in the 19th century. During the 20th century the city was a center for Black migration from the South, the campaigns to win recognition for labor rights within the industrial companies, and the birthplace of significant organizations such as the Nation of Islam (NOI), Motown Records, the Republic of New Africa (RNA), the League of Revolutionary Black Workers, among others. The first massive march for Civil Rights was held in the city on June 23, 1963 where hundreds of thousands of people demonstrated for an end to segregation and institutional racism both in Detroit and throughout the South. Dr. King delivered an earlier version of his “I Have a Dream” speech prior to the March on Washington some two months later. This “Detroit Walk to Freedom” was led by Dr. King along with local luminaries who were the principal organizers such as Rev. C.L. Franklin, James Del Rio and Rev. Albert Cleage (later known as Jaramogi Abebe Agyeman). Unions, churches, community organizations and civic groups provided tremendous material and political assistance to the Southern Christian Leadership Conference (SCLC) and the Student Nonviolent Coordinating Committee (SNCC) in the 1950s and 1960s. 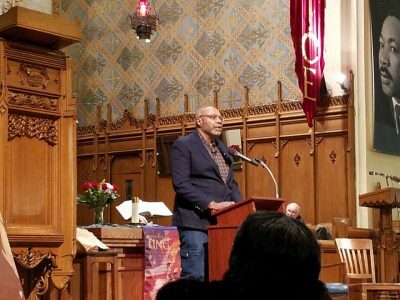 For 15 consecutive years Detroit activists have held a rally and march in downtown Detroit in an explicit effort to honor the actual Civil Rights and peace legacy of Dr. King. 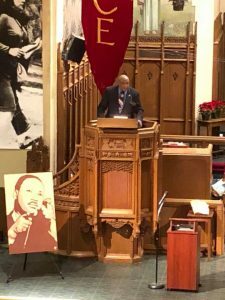 The event is held at Central United Methodist Church (CUMC) and St. John’s Episcopal Church located on Woodward Avenue, two locations where the Civil Rights leader had spoken over the course of his life. The rally took place at CUMC beginning at Noon where Rev. 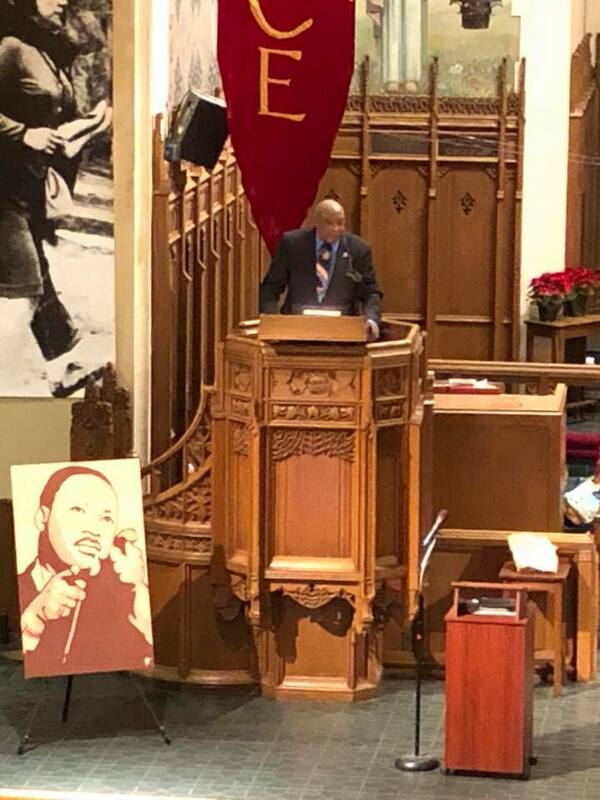 Dr. Bernard Lafayette was the honored guest and keynote speaker. Lafayette worked with the two leading Civil Rights organizations of the 1960s, SNCC and the SCLC. King’s last effort was centered on building the Poor People’s Campaign where thousands of people were mobilized to occupy space in Washington, D.C. to demand that Congress take immediate legislative action to end racism, unemployment, poverty and inadequate housing. People of all races and nationalities were recruited including African Americans, Mexican Americans, Indigenous nations, Puerto Ricans and low-income whites. The Poor People’s Campaign demanded that there be full employment, a guaranteed annual income, national health insurance and the rebuilding of the urban and rural areas where the oppressed and marginalized workers resided. Lafayette spoke on how he became involved in the Civil Rights Movement after growing up in Tampa, Florida in the 1940s and 1950s. In 1958 he was accepted to the Baptist Theological Seminary in Nashville and as a freshman attended courses delivered by James Lawson of the Fellowship of Reconciliation, where the genesis of the mass campaigns to end Jim Crow was intellectually conceived. He was a participant in the sit-ins and freedom rides in the early 1960s. Lafayette was involved when Dr. King and SCLC came to Chicago in 1966 to test out their model of nonviolent resistance in a northern city. Other speakers and artists presenting at the rally included: Frank Hammer of the ASOTRECOL Solidarity Network in support of injured General Motors workers in Colombia; Jonathan Roberts, an organizer for the Restaurant Opportunity Center of Michigan and the One Fair Wage campaign; two youth spokespersons for the Poor People’s Campaign of 2018, Crystal Bernard and Carlos Santa Cruz; Kimberly Simmons of the Juvenile Lifers Support Group; Cynthia Thornton, president of Pride at Work Michigan; Atty. Vanessa Fluker spoke on the rising rates of blood lead levels among children in Detroit; Amer Zahr, a Palestinian American writer and Adjunct Professor at University of Detroit Mercy Law School brought solidarity messages; Detroit Jazz artist Bill Meyer performed as well as Bobbi Thompson’s Deep River Choir, and soloist Shirley Jackson. Medallion awards for participation in the Selma to Montgomery March of 1965 were awarded to Detroit activists George Giffin, Frank H. Joyce, Wilbert McClendon, Atty. Dean Robb, Selma native Terry Shaw and Rudy Simons. The People’s Spirit of Detroit Awards were given to Zonzie Whitlow, a Detroit proprietor and longtime friends of the late Rosa and Raymond Parks; Alfonzo Hunter, lifelong resident of the West Grand Blvd.-Clairmount neighborhood and board member of the Virginia Park Investment Associates; Katrina Brown, a teacher in the Detroit Public School Community District; and Jim Rehberg of the Wobbly Kitchen. At 2:30 the march stepped off from CUMC weaving through downtown to demonstrate against ongoing foreclosures and evictions, water shut-offs, mass incarceration, the role of the banks in creating the economic crisis in the city and the subsidization of wealthy corporations at the expense of the majority African American and working class residents of Detroit. The day ended with a community meal prepared by the Wobbly Kitchen and a cultural program held at St. John’s Episcopal Church. A host of artists performed including Marilyn Lowen, Wardell Montgomery, Students from the Arts Academy in the Woods, Willie Williams, Shushanna Shakur, Joe Kidd and Sheila Burke and Jim Perkinson. The cultural performances were assembled and coordinated by Detroit writer and educator Aurora Harris. The event was sponsored and endorsed by numerous organizations, businesses and individuals throughout Metropolitan Detroit such as the Michigan Emergency Committee Against War & Injustice (MECAWI), U.S. Palestine Community Network, the Metro Detroit A. Phillip Randolph Institute, Michigan Coalition for Human Rights (MCHR), the ACLU of Michigan, Asian Pacific American Labor Alliance, Buck Dinner, Detroit Active and Retired Employees Association (DAREA), Green Party of Michigan, Episcopal Diocese of Michigan, Retired Bishop Thomas Gumbleton, Huntington Woods Peace, Citizenship & Education Project, Jewish Voice for Peace, Michigan Peoples Defense Network (MPDN), Michigan Welfare Rights Organization (MWRO), Workers World Party, On the Rise Bakery, People’s Water Board, David Smokler, Linda Szysko, Melvin Thompson as a former President of UAW 140, UAW Local 140 Civil and Human Rights Committee, UAW Local 160, Viola Liuzzo Park Association, Retired Rev. Bill Wylie-Kellerman of St. Peter’s Episcopal Church, Charlevoix Village Association (CVA), Mothering Justice, The Spark, UAW Local 869 and Avalon Bakery, to name some of them. 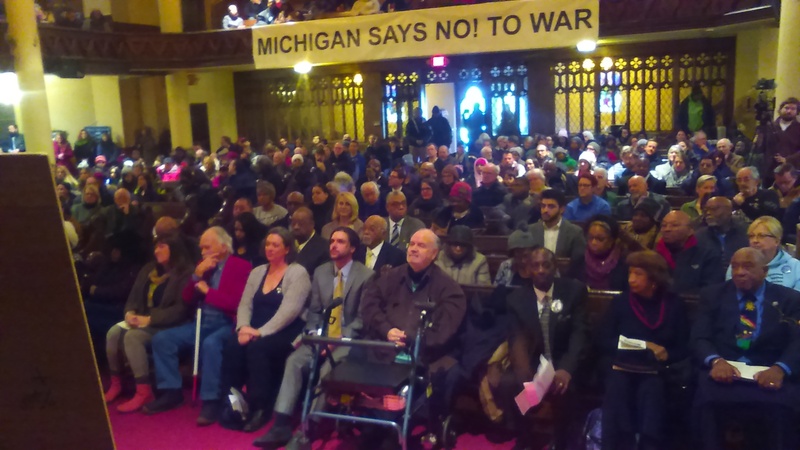 The MLK Day Rally & March enjoyed wide press coverage from all of the Detroit television stations, WWJ News Radio and the Associated Press.